The biggest and most popular poker championship of Hungary, the Budapest Poker Open took place from November 26th to December 2nd, in the beautiful setting of the Tropicana Casino in Budapest. This was the third time this championship was staged, and this year's event was by far the most palatial of all. Registration for the €740 NL Hold'em Main Event had to be closed a few days before the beginning of the tournament, as the number of entrants reached the maximum of 360. This was quite a shock, as many people forecasted this number to barely reach 200. For this reason, and because registration could only be made personally on the spot, only a few international players could enter the championship, but due to the numerous satellites, it was obvious that the prime cut of the Hungarian field was to be seen. Besides the well-known live players like Richárd Tóth, Dániel Varró, András Karkus, György Móger, Balázs Micsinay, many less known, but very successful online players like Péter Traply also entered the competition, which was a guarantee for high-quality poker. With 360 entrants, the prize pool reached €267,000, with a first prize of roughly €67,000. The first three days of competition (Days 1/a, 1/b, and 1/c) saw fast action, as the 120 players each day had to battle from 3:00 pm until 4:30 next morning, to narrow down the field to only 46 players for Day 2. This kind of long, tiresome play favoured mostly the big-name pros, who amassed most of their stacks in the last two or three hours of each day. Day 2 began at 16:00 on Saturday, with most of the known players, like András "BANI" Karkus, Csaba "Csabóka" Kuremszki, György Móger, Balázs "Ruib" Micsinay, Richárd "Ricko" Tóth, Dániel Varró, and Péter "Bélabácsi" Traply still in the field. The highest chipstack was in front of Zsombor Gáll, with 202,775 chips, and the shortstack was Péter "Belabacsi" Traply, with only 19,700 chips. As the MTT rules were only introduced as of this year, this day was about to surprise some of the players used to the old rules, as the day began with huge differences between the stacks, and the blinds were relatively large too, beginning from 1600/3200, with 400 ante. The day began with the same pace that characterised the first three days, but as the field got closer and closer to the money bubble (30 players), the action got much slower. The bubble eventually burst at 8:30pm, when Péter Traply caught a straight on the river against István László. Shortly after, Richárd Tóth, who was rather unlucky during the whole tournament got his big moment, too: he caught three all-ins in one round. Among them was György Móger, one of the favorites of the tournament, but he had been short stacked in the previous round against the only female player at this stage, Viktória Szilasi. Richárd had pocket KK when he called the re-raise all-in, which further strengthened with a third King on the flop. Tóth went short stack just to come back with a multi-way all-in several times during the night, to end up busting out in 12th place, which earned him €4000. Among those falling out of the torunament at this stage was Zsombor Móger, nephew of György Móger, the youngest player, who just turned 18, and got the buy-in for this tournament as a present from his uncle. He finished in 23rd place, and won €2666 for his first ever poker championship. By 2:00 am, the players were down to the last ten, with most of the bigger and better known names already out, and during the next hour, four more players busted out, among them Péter "Belabacsi" Traply. Only Miklós Koszta and András "Bani" Karkus were left in the six players to play the final table, from those considered probable winners. The action was surprisingly slow, with roughly nothing happening in the first 50 or so hands. In the 75th hand, András "Bani" Karkus, was busted out in 6th place, earning him €10,600. After that point, not much can be said about the game, which lasted 10 hours, and probably involved the most pre-flop folds a tournament final has ever seen. The other five players basically got slowly eaten up by the blinds that were constantly raised by the tournament director who was desperately trying to galvanize some life into the game. Down to the last two players, Kéri went all-in with A-5, which was called by Duró with A-J, and the board came: A-2-8-K-Q. Duró won €67000 for his first place, while Kéri earned €40,000 for his play. 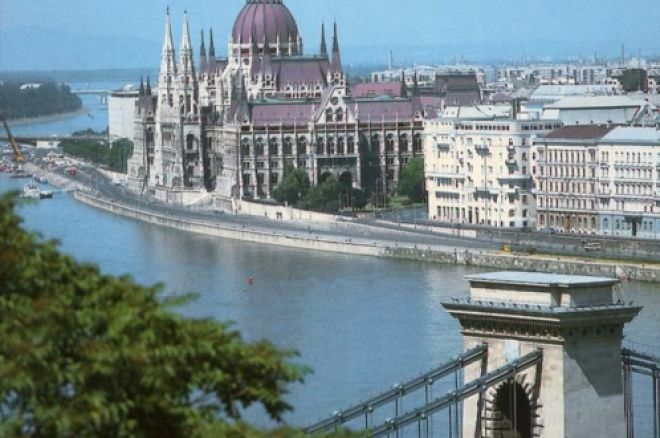 Despite the slow pace of the final table, the overall level of the field was quite high, and the Budapest Poker Open 2008 promises to be an even greater tournament!